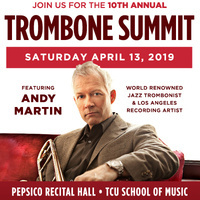 Join us for the 10th Annual Trombone Summit, featuring Andy Martin, world renowned Jazz trombonist and Los Angeles recording artist. Hosted by the TCU School of Music, the Trombone Summit will feature masterclasses and performances throughout the day, culminating in guest artist performances with the TCU Trombone Choir on the evening concert. High School Solo Competition - 1,000 Grand Prize - toward the purchase of a Bach-Conn-Selmer Trombone - sponsored by Conn Selmer. Contact Dr. David Begnoche, Artistic Director, for more information. If you have a TCU ID, please login with your TCU account. If you do not have a TCU ID, please login using one of the social options below to interact with events, personalize your calendar, and get recommendations. If you do not have a TCU ID nor a social login, please login with your email address below.